Praising God tonight that the five Gwinnett County Firefighters are safe and sound at home with their families. FirefighterWife.com has a challenge right now to encourage and empower women to be #FireStrong. To stop negative thinking. To smile. To get rid of things (and people) that hold you back. To be mentally and emotionally healthy. Life is short and we aren’t guaranteed another day…or even another minute. Just like those Gwinnett firefighters who answered a routine call for help. They had no idea that what was behind the door of that house was their worst nightmare. A question was asked tonight following the hostage situation by WifeOnFire to all the fire wives about what they will do in order to not add yet another worry to their list while their firefighters are on shift. Most responses did have something to do with praying or trusting that God is in control. And He is. All the time. My favorite response to the question would have to be to have “#FireStrong Faith“. This type of faith can be summarized with Joshua 1:9. 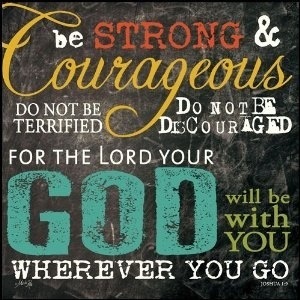 What a refreshing feeling to know there is no reason to fear or to be discouraged. He is with us EVERYWHERE we go. All the time. He has commanded us to be #FireStrong. his verse joshua 1:9 is my 15 yearcold daughters life verse. I think it I’d often overlooked and a very good one!